When organising a holiday for a large group of friends, it can be difficult to know where to start, especially when you have to consider the needs and desires of everyone in the party. In most groups you are likely to have several adventurous types, a few who prefer to chill out in a spa, those who have high expectations for gourmet food and others who are all about the night life. With this in mind, we carried out some independent research to determine exactly what is important to groups of friends when deciding on a group holiday. From this information, we have found the perfect solution for a holiday with friends, a ski trip to the world-class resort of Chamonix. I don’t want to ski, why choose a ski holiday? What element is most important to groups of friends holidaying together? What is the most important factor when planning a holiday with friends? Over half of our respondents considered Accommodation to be the most important factor, with Quality of accommodation receiving 9% more of the votes than Price. Quality became increasingly important in direct relation to the age of the respondent, the category received 21% of the votes from 18-24 year olds whereas it received 38% of the votes from 35-44 year olds and a further 38% from the 45+ age group. Scenery and sightseeing also became more appealing with age. The opposite, however, applied when it came to Available activities, with the highest vote coming from the younger age groups. Variety of nightlife was of highest importance to 25-34 year olds, with 18-24 year olds following close behind. This survey applies to all types of holidays for groups of friends, across all seasons and destinations. Interestingly, our results were in line with a similar survey carried out in 2016 by the Ski Club of Great Britain which was specifically aimed at ski holidays. When asked about the most important factors when choosing a ski holiday, the top answers naturally applied directly to skiing, with Guaranteed snow and Size of ski area receiving the most votes. The third most popular answer, however, was Quality of accommodation, highlighting that no matter what type of holiday you choose this is clearly of high importance. As our survey highlighted, selecting the right, good quality accommodation is an integral factor for ensuring the success of a group holiday. 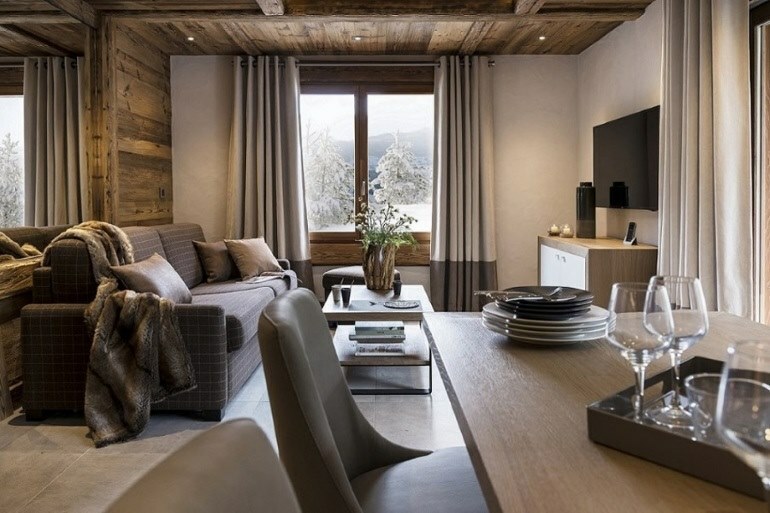 Chamonix boasts a wealth of top end accommodation, with numerous four star hotels, plus a five star residence Le Cristal de Jade, which was new for the 16/17 season. Even if you are sticking to a tighter budget, there are a wide range of apartments and hotels on offer, ranging from two to five stars. An apartment enables the group to spend the maximum amount of time together, as it provides a communal hub for the group to chill out and unwind off the slopes. More often than not, apartments prove to be a more cost effective option. The reduced cost of apartments as opposed to hotels means that the group have additional funds to spend on recreation, such as spa or sightseeing days. The self-catering option is also appealing for groups for a number of reasons. Evenings spent cooking and eating together in the apartment can be great fun for a group, not to mention cost effective. Some of the higher starred apartments feature pools, saunas and jacuzzis, plus some of the other perks usually associated with hotels. That being said, hotels can offer certain benefits over apartments, namely flexible arrival dates and short break availability. With Geneva airport just an hour away, Chamonix is a great resort for short ski breaks and ski weekends, so if your friends don't fancy a full week away, a hotel could be the best option for you. For many years Chamonix has been a first choice ski destination, attracting visitors from all over the world. 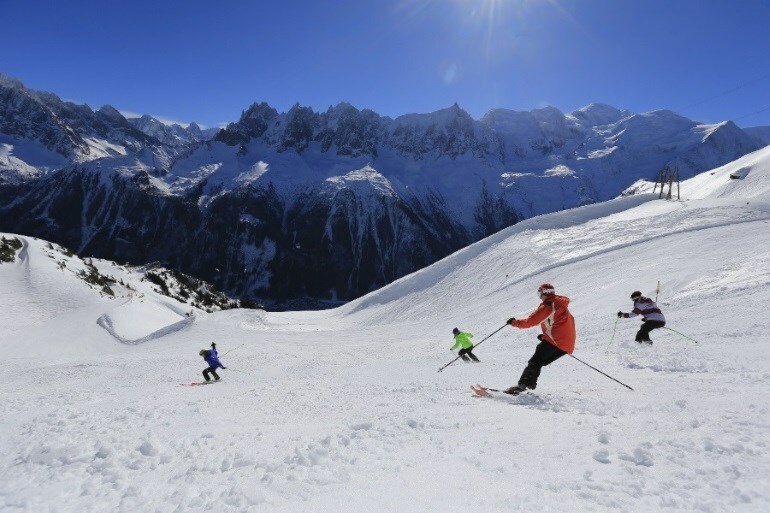 With five different ski areas on offer (two of which are linked together, with the rest separated along the valley), there is huge range of terrain to explore in Chamonix. The resort is best known for its expert terrain, with a wealth of off-piste opportunities for advanced skiers, but there are still some nursery slopes available to beginners and a good mix of blue and red runs to satisfy intermediate skiers and boarders. Skiing is undeniably a social activity, even if your group is split up due to different abilities. No day on the slopes is complete without the inevitable meet up in the evening for some well-earned après ski (even if your day was simply spent lounging in the spa!). Chambre Neuf – Live music, happy hour from 8 and a DJ until 1am, what’s not to like? Elevation 1904 – For a more chilled vibe, complete with a superb sun terrace. La Terrasse – Centrally located with an earlier, longer happy hour running from 4-6 each day. Live bands also play at La Terrasse. Micro Brasserie de Chamonix – Known locally as MBC, the micro brasserie with its vast selection of beers is a must for real ale fans. Also featuring live entertainment, plus some of the best burgers in town, MBC is well worth a visit. The Pub – If you want to catch up on live sport or make the most of a heated outdoor terrace, head to the British styled Pub. Monkey Bar – Head to Chamonix Sud to find the Monkey Bar, a popular après ski destination due to the phenomenal views from the sun terrace, not to mention the 2-for-1 happy hour, live bands and late night DJs. 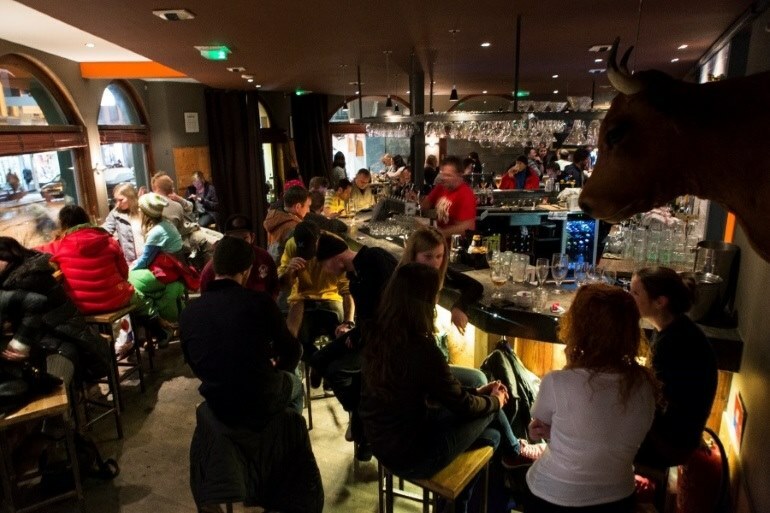 South Bar – Possibly Chamonix’s coolest party hotspot. South Bar boasts a sunny terrace, 2-for-1 cocktails from 8-10, live music then DJs and dancing until 2am. L’Amnesia – For late night partying head down to L’Amnesia, Chamonix’s largest nightclub. Regularly attracting world renowned DJ’s, L’Amnesia’s doors are open every night between 1am until dawn. If your group is more interested in working their way through the local cuisine than the cocktail menus, Chamonix offers some of the best eateries in the Alps. With restaurants ranging from Michelin starred fine dining experiences to more rustic local fayre, Chamonix has something to suit even the most seasoned foodie. Here’s our round up of a selection of Chamonix’s best restaurants and cafes. Tendence Foehn – If you fancy a lighter meal, this local snack bar is perfect for home-made wraps and sandwiches. L’Adret de la Flegere – The perfect spot for a sit down meal, complete with local alpine cuisine. La Bergerie de Planpraz – Take away or eat in, this superb chalet style restaurant boasts a comprehensive menu from steaks to fish to Savoyard specials. Savoyarde: La Caleche – Centrally based, La Caeche is an inviting local restaurant which serves a wide range of Savoyarde specials. Fine Dining: Hameau Albert Premier – Chamonix’s 2 Michelin starred restaurant, Hameau Albert Premier boasts delectable a la carte and set menus, accompanied with fine wines from their extensive wine cellar which features over 20,000 bottles. Italian: Casa Valerio – All the Italian favourites from pasta, pizza and meat and fish dishes. Casa Valerio stays open until 2am, making it perfect for a late night bite. Vegetarian: L’Impossible – Renowned for creating Italian inspired vegetarian cuisine using only the finest, freshest local ingredients. Dairy and Gluten free options are also available. Japanese: Satsuki – Delicious Japanese cuisine, including noodle dishes, sushi and sashimi. Indian: Tiger Tiger –Contemporary Indian dining based on the traditional classics. The great thing about a destination like Chamonix is that you don’t have to be a skier to have a great time. First class skiing is just a small part of what the resort has to offer which is why it is such a popular choice for groups of friends all year round. As Chamonix is a sizable town, there are lots to of non-ski activities to partake in throughout the year. Potter around the boutiques, spend a day (or two) in a luxurious spa, sample the local cuisine, experience the culture or simply enjoy some people watching over a drink or fresh coffee at one of the many bars or cafes lining the streets. Take in the spectacular local scenery with informative Sightseeing Tours. 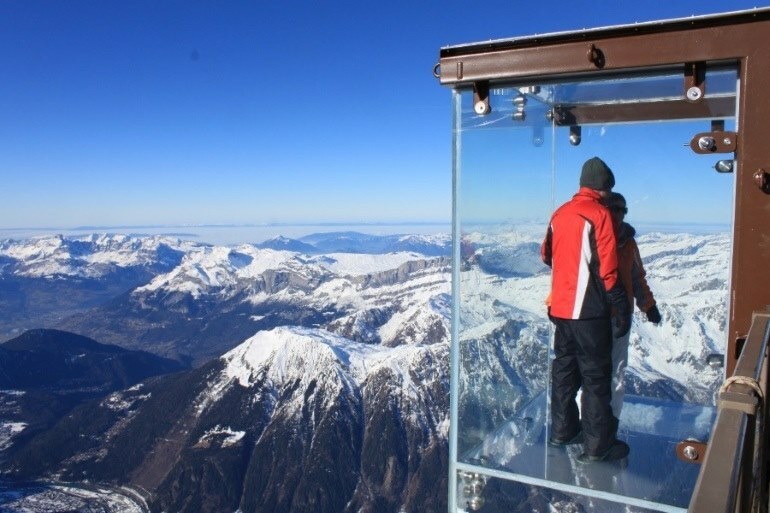 Step into the Void – A glass viewing platform, at an altitude of 3842 metres, this attraction claims to be the highest in Europe. There are several excellent museums and art galleries in and around Chamonix that are well worth a visit. Chamonix boasts some excellent spas and pools, several of which are part of the hotels. Facilities are often open to the public upon reservation of spa treatments. Enjoy the stunning lakes around Chamonix, perfect for hillwalking or just sightseeing. Ski holidays are commonly perceived as being expensive. Admittedly, they aren’t the cheapest of holidays, but it is still possible to stick to a reasonable budget if you are smart with what you choose to buy, borrow or hire. If you're relatively new to snowsports, have a look at our guide about what to buy, borrow and hire when heading on a ski holiday. There are numerous ski hire shops in Chamonix where you can hire equipment for the duration of your stay, or even just for an afternoon if you decide to give skiing a quick try. Skis and boots come with a hefty price tag, and are only worth the investment if you ski regularly. Beginners are well advised to utilise the many ski hire shops in Chamonix, whilst they are getting the feel for snow sports. This also brings the additional benefit of avoiding extra baggage fees at the airport. What should you buy or borrow? There are a few essentials that you will definitely need to take on your trip to ensure that you are prepared for a day on the slopes and well-equipped against the cold mountain weather. Most of these items can be bought relatively cheaply or maybe borrowed from a friend. You may even find that you already have some of the items at home that you can use for your trip, such as sports base layers or thermals. Jacket and salopettes - First things first, you will definitely need a warm, waterproof jacket and salopettes before hitting the slopes. These are great items to borrow from generous skier friends if you don't already have your own. Alternatively, keep an eye out for deals and discounts at the shops – you'll be able to find what you need at mountain-wear specialist stores such as Trespass and Ellis-Brigham, but shops like TK Maxx and Aldi also offer ski outerwear at reasonable prices. Gloves – Waterproof gloves are essential, otherwise you’ll get very cold and wet hands as you make adjustments to your boots and get on and off ski lifts (not to mention falling over if you’re learning). It's also worth bringing a spare pair so you avoid having to put a damp pair back on after lunch! Hats and buff/bandana - Ensure that your hat is warm, snug fitting and isn’t likely to fall off or slip down over your eyes. It is also a big bonus if it can be pulled down over your ears to keep them warm. If you're planning to wear a helmet on the slopes (this is strongly recommended, particularly for beginners) opt for a hat that will fit easily underneath. Buffs or bandanas are also useful for keeping your face protected from the cold mountain air. Layers – Pack several thin tops and fleeces as ‘layering up’ is essential for keeping warm on the slopes. You don’t necessarily have to invest in specific thermals, long sleeved t-shirts and leggings will do, however if you do have thermal underwear or base layers they will certainly make a huge difference when it comes to locking in the warmth and keeping out the cold. Socks – Lots of them! It is important to invest in specialist ski socks, they are not particularly expensive and the benefits far outweigh the cost. Not only do they provide additional warmth, they are also usually made from material which absorbs sweat, helping keep feet dry and reducing the risk of rubbing and blisters. Sunscreen and lip balm with a SPF – You don’t have to be lying on a beach to get sun burn, the sun’s rays can be brutal when reflected off the snow, especially at high altitude where the atmosphere is thinner. Sunglasses and goggles – Essential for keeping the sun out of your eyes, it can be particularly dazzling with all that white stuff around. It is recommended to also have goggles to hand in case it gets blizzardy or starts to snow – sunglasses won’t be sufficient if the weather turns. Walking boots or snow boots - Although they aren’t the most attractive form of footwear they are definitely best choice for day-to-day wear in a ski resort. They will prove to be essential if it is slippery and there is nothing worse than snow soaked sneakers. Swimwear –You will never appreciate the luxury of jacuzzis, saunas and heated swimming pools until you step into one after a long day on the slopes. Don’t forget your slippers! - You will be taking off your boots by the door so you will want to keep your toes toasty once inside. Also, after a day on skis, comfortable feet will be a high priority! 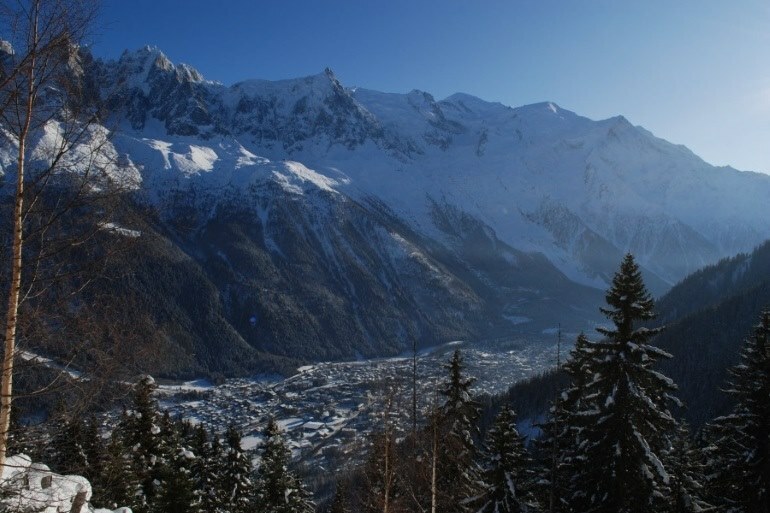 Chamonix is also a great place to visit out of season when snow is no longer the focus. Thrill seekers can still get their kicks from white-water rafting, paragliding and mountain biking and the stunning lakes provide a beautiful backdrop to any activity, even if that is just kicking back and enjoying a picnic at the water’s edge. Explore the beautiful town of Chamonix itself, immerse yourselves in local history or experience some of the not to be missed events, such as the Climbing World Cup, the Chamonix Yoga festival or one of the spectacular festivals hosted in Chamonix.